Google was introduced the Material Design in Lollipop 5.0 API 21 which RecyclerView is one of the Material design. Android RecyclerView is much more better than old generation ListView because it is more advanced and more flexible version of ListView. Besides, it can control the layout of the list by using the LayoutManager unlike ListView are always remain the vertical list. Moreover, the CardView widget is a new component that display the item in RecyclerView to make it look better. In this tutorial, I will teach you some simple steps to coding the RecyclerView in your application. You will just take a little time to complete and make you easy to understand. 2. Create a new project and Edit the Application name to “RecyclerViewExample”. 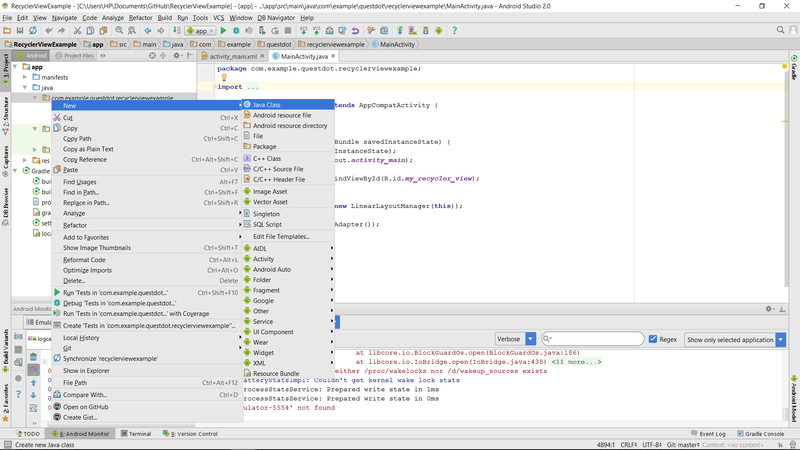 To activate the RecyclerView in your project, you should add dependency in your build.gradle (Module:app). Just add “compile ‘com.android.support:recyclerview-v7:23.3.0′” in your dependencies. After add your dependency, create a new java class and name it as MyAdapter. This class is the adapter of data set. In the MyAdapter.java class extends RecyclerView.Adapter to get the RecycleView method in the class. This class will handler the views (eg. textview) of recyclerview. – It will automatically called when the RecyclerView need the ViewHolder to represent an item. – It called by the RecyclerView to display data in specific position. – It return a total item in the dataset. * Created by HP on 10/5/2016. In the layout, open activity.main.xml and add recyclerview widget to your layout. After that, copy below code to your MainActivity.java. This activity set RecyclerView to linear layout and set the adapter that you created above “MyAdapter” class. You also able to set your layout to Grid View by using GridLayoutManager. In this example, I am using LinearLayoutManager to display the recyclerview. Now, you can start your project in your emulator or android device. RecyclerView is very easy to implement, you just need more practice and understanding the source code.